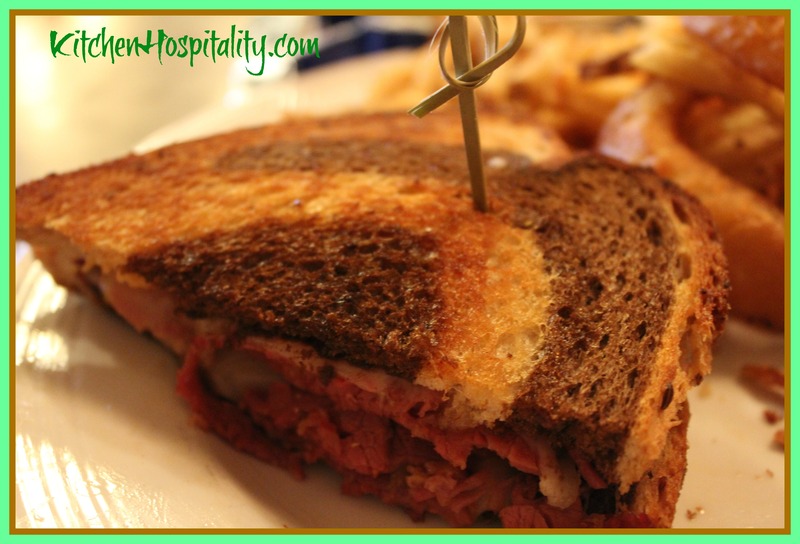 Is it the corned beef, rye bread, or sauerkraut that makes a Reuben sandwich Irish? If you research the history of the Reuben sandwich, you’ll learn that it originated in New York City when it was invented by German immigrant Arnold Reuben. Neither corned beef or sauerkraut (fermented cabbage) is a popular food in Ireland. You can, however, find organic rye bread there. Irish immigrants to America substituted corned beef for pork because it was less expensive. So if you’re planning a trip to Ireland and hope to enjoy the best Irish Reuben sandwiches everywhere, you should probably count on fish and chips instead. No need to go so far to enjoy a Reuben sandwich. You can, most likely, find one at a restaurant close to home. “YES!” I quickly replied. My sweet friend Patty, a music teacher, had introduced me to a lovely little restaurant with fabulous food about a year ago. Every menu item I’ve ever ordered there tastes amazing. On Fridays they don’t serve breakfast like they used to, so we had lunch. Since St. Patrick’s Day is coming up this week, Patty decided to order their Reuben Sandwich. “I think I’ll get the Patty Melt,” I mentioned. That sounded good to Patty, so she changed her mind. “I think I’ll order the Reuben Sandwich to honor St. Paddy’s Day,” Patty said. When I decided on a Patty Melt, however, that sounded good to Patty, so she changed her mind. “Why don’t I order one and you order the other, and let’s eat one of each,” I suggested. We agreed on sharing our sandwiches. I can’t recall the last time I had eaten a Reuben, so I wasn’t sure if I’d like it. It tasted better than delicious. In fact, I liked it better than the Patty Melt. I came across a good recipe for a Reuben sandwich at gastronomersguide.com that I think I’ll try sometime. There is a certain technique, explained by Gastronomer Joseph Erdos, to making the sandwich with its Russian dressing. I like Joseph’s idea of making the sandwich with soda bread (now that’s a bread you could surely find in Ireland from what I hear). The best soda bread I’ve ever had is from a little southern country restaurant in Texas. Just writing about this is making me crave a Reuben sandwich on soda bread. In fact, a soda bread Reuben sandwich recipe will make an excellent St. Paddy’s Day entree to surprise my family with. The one I especially hope to impress is my toddler granddaughter. If SHE likes it, then I’ll know it’s good. Got a special St. Patrick’s Day food you like? Anything unique? Like dying your rye bread green or some other fun idea? Share it with Kitchen Hospitality, and I might try it out. I love a good reuben sandwich, but I can`t imagine eaing it on soda bread. I think I would miss the strong taste of rye.